Same " original art " sold repeatedly . This seller seems to sell the same so called " original " art works repeatedly . Identical painting sold on ebay ! Made in China !! Signed and claimed as own work . It is interesting that according to the ratings of both seller and buyer , these previous transactions were successful - So why are the items relisted ?? Shill bidding or these are not original works but mass produced giclee prints similar to those sold on ebay ?? Have you reported this to communitywatch@bidorbuy.co.za? If not, perhaps you should. All those nudes look identical. 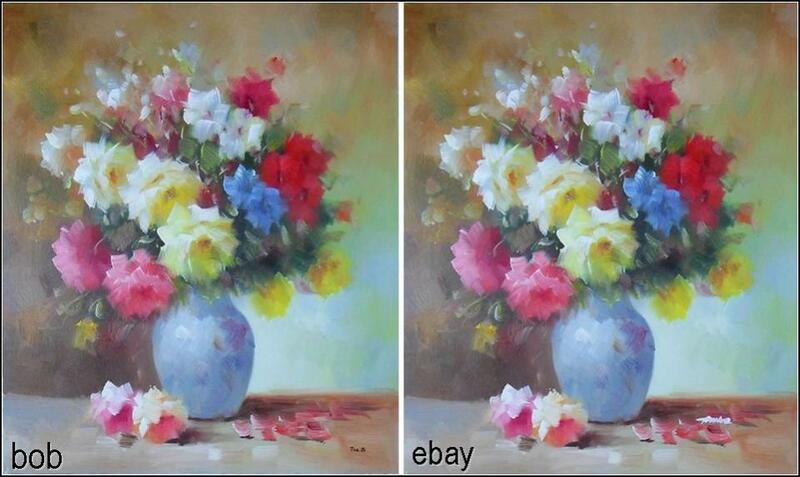 The eBay picture of the vase has some differences but still look almost identical. I did report it but like most of these issues it's hard to prove beyond any doubt , especially when the seller claims to have painted the work herself copied from the original . But I challenge ANY amateur artist to copy a painting of complexity identically - even the brush strokes are the same - you can clearly see when you zoom in on the photos . There are a small bumps of texture in the paintings which would not have been naturally duplicated in copying a work . These paintings are identical and I do not believe the one is a painted copy of the other. I can see what you're getting at! Very strange indeed. The BoB picture does not have the white paint on the right hand side of the vase which is in the eBay picture, that is the first difference I picked up straight away and if you open 3 or 4 tabs on your browser each with a picture of the naked lady in, you can flick between them and see they don't even deviate a bit so making them all the same pictures. Then if you can't nail them for the other pictures then they surely can be nailed for that "white signature" issue. Funny that this thread is the topic tonight when there are two Mona Lisa paintings now in the world and both seem to be the original. Just had a look at one of the other paintings sold by this artist and the very same painting was online in 2009 under another name with a signature of another artist and on another forum/site. I smell some fishy paste here. Look at these two paintings, both have different names on them. Two of about 5 or 6 paintings I looked at came up at deviantART and the same guy was showcasing them on a forum. Interesting. Anyone for a donkey? Was thinking the same thing. Maybe there are a few originals and among them a few copies, who knows. You better tell him about the other paintings too as Admin might just spend all night looking at those twins. A few originals and a few thousand copies. These paintings are machine produced made in China. They are mass printed and readily available for wholesale purchase. The technique of production is very clever as the paintings look like oils . They are signed randomly and the same painting will often appear with different signatures. There is nothing wrong with selling these works as reproductions but when somebody blots out the signatures , resigns them and sells them as her own it is FRAUD ! These are definitely not original artworks and misleading buyers in this way is not only blatantly dishonest , it questions the credibility of all artists selling on the site. It is very unfair to those who are trying to make an honest living from their own authentic art work . I have brought this up before,they are actually original paintings painted in sweatshops.And these people are treated like slaves.90% of the paintings are stolen images from other Artists on the web,we have been dealing with this on another Art forum for 5 years. This is really VERY annoying . I actually questioned the seller and she maintains that she painted them herself. I cannot believe people can be so unscrupulous and greedy . Here is yet another one . An IDENTICAL replica !! I really hope BOB does something about this . Who is the seller trying to kid - what kind of fantasy land is she living in - how on earth can she even refer to herself as an artist ? As a part time hobby I paint and sell the occasional painting and never in a million years would I ever even dream of trying to pass off someone else's work as my own! 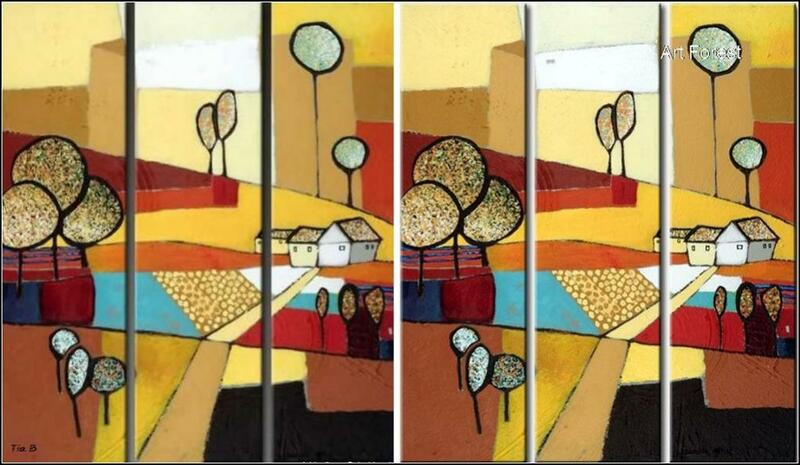 There are hundreds of copies of these paintings and they can be bought wholesale from numerous suppliers . Wholesale supplier of IDENTICAL works here . 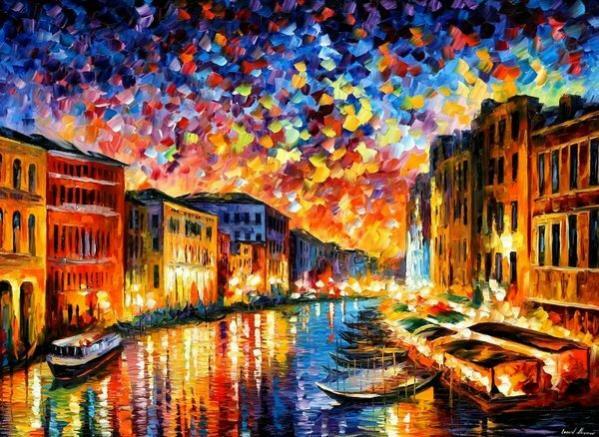 Oil Painting Wholesale, Cheap Oil Paintings from China? The sad thing about this is that buyers are none the wiser ! They think they are buying original art and are getting cheap mass produced works that they can purchase for a fraction of the price from wholesale framing places. The buyers, the Artists,and BOB/ebay etc. loose out. 1 : The buyers are NOT buying an investment. 2 : Original Artists are forced to sell at low prices,because these "paintings" flood the market at low prices. 3 : BoB loses on the extra commission original paintings should sell for.